But between 2001 and 2016, fifteen “charitable grants”, totaling $1.1 million, were accepted from the Glaser Progress Foundation of Seattle-based RealNetworks/Progressive Networks Inc. founder, chairman of the Board and CEO Rob Glaser by the "parallel left" Democracy Now! show producers-hosts. “He started out by managing the company’s relationships with some outside engineering teams that were helping it develop products. After about a year of that he was staffed to relaunch Microsoft Word…By 1987, Rob’s responsibilities were touching on product planning for all of the company’s application software. 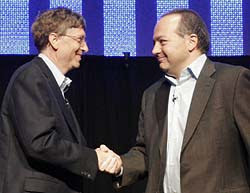 “Glaser…had arrived at Microsoft in 1983, at age 21…He quickly became one of the key people in the organization who advised Gates...It was Glaser who pioneered Microsoft’s push into multimedia and oversaw Microsoft’s transformation from a software company focused primarily on Windows and DOS to one where content became increasingly important. Besides using some of the big money he obtained, from his 1980s and early 1990s involvement in helping Bill Gates build his for-profit Microsoft business empire, to buy part of a baseball team and start his RealNetworks/ProgressiveNetworks Inc. for-profit company in 1990s, former Microsoft VP Glaser also used some of his Microsoft-obtained wealth to establish the Glaser Progress Foundation that has helped fund Democracy Now! Productions since 2001. And, not surprisingly, not many news segments letting listeners and viewers know how either Glaser, Bill Gates or Microsoft acquired their personal or corporate wealth during the 1980s and 1990s have been aired or broadcast by Democracy Now! since 2001. 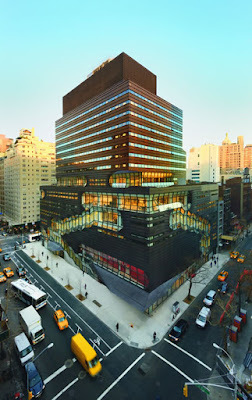 The tax-exempt New School University in Manhattan claims to be a “non-profit” institution. Yet according to its Form 990 filing for the year beginning July 1, 2014 and ending June 30, 2015, New School University paid its president, David Van Zandt, a total annual compensation of $1,286,270 in 2015. In addition, an annual salary of $175,000 was also paid by New School University to its former president, New School University President Emeritus Robert Kerrey, in 2015. In 2015, the “non-profit” New School University also paid its Provost, Tim Marshall, a total annual compensation of $549,537, while New School Chief Enrollment and Success Officer Donald Resnick was paid a total annual compensation of $481,378. In addition, the New School’s Chief Legal Officer, Roy Moskowitz, was paid a total annual compensation of $469,437 in 2015, while the New School's Chief Marketing Officer, Anne Adriance, was paid a total annual compensation of $398,763 that same year. New School Senior Vice-President for Academic Affairs Mary Sanger was also paid a total annual compensation of $372,214 in 2015, while a total annual compensation of $345,131 was paid to New School COO Olatokymbo Shobowale that same year. Four other New School Senior Vice-Presidents or Vice-Presidents--Arand Padmanabhad, Linda Reimer, Carol Cantrell and Lia Gartner--were also paid total annual compensations exceeding $300,000 by the “non-profit” New School University board of trustees in 2015. The Deans at New School University in 2015 also apparently were paid a lot more by the “non-profit” New School in real wages than New School cafeteria and clerical workers were paid in 2015.. A New School University Dean named Stephanie Browne, for example, was paid a total annual compensation of $410,924 in 2015, while a New School Dean named Joel Towers was paid a total annual compensation of $389,873 that same year. Two other New School Deans--William Milberg and Richard Kessler--were also paid total annual compensations exceeding $320,000 by the "non-profit" New School University board of trustees in 2015. 4. New School Professor Ann Stoler was paid a total annual compensation of $320,825 in 20r15. 10. New School Chief Development Officer Mark Gibbel was paid a total annual compensation of $138,953 in 2015. Two New School University contracts, valued at over $5 million, were also given, between July 1, 2014 and June 30, 2015, to two firms owned by family members of two members of the New School University board of trustees, according to New School University's Form 990 financial filing. "The Ford effort took a new twist in 1966, when the Foundation began plotting a system that would unite satellite communication with educational broadcasting. McGeorge Bundy, the former national security advisor who had personally ordered American bombing raids on North Vietnam in early 1965, left the government and moved to the Ford Foundation to oversee this plan...Bundy obtained his position without being knowledgeable about, or even comfortable with, the medium of television..."
"The Trustees of the Ford Foundation are deeply saddened by the death of McGeorge Bundy on September 16 . Mr. Bundy served as President of the Foundation from 1966 to 1979. He forged new lines of work in such critically important areas as civil rights, overseas development, and security and arms control. 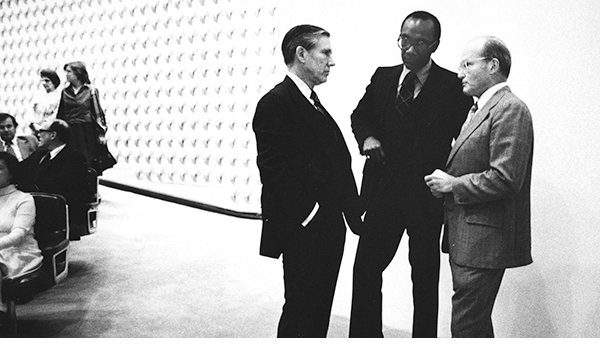 His intellect, candor, and high standards left an indelible mark on the Foundation's culture. The work of the Foundation today builds on Mac's legacy and we are in his debt." But evidence exists that former Ford Foundation President McGeorge Bundy was apparently one of the White House officials responsible for planning crimes against humanity during the Vietnam War Era, in violation of the Nuremberg Accords. On May 11, 1961, for instance, former Ford Foundation President McGeorge Bundy signed "National Security Action Memorandum 52" which approved a program for covert action against North Vietnam that included forming "network of resistance, covert bases and teams for sabotage and light harassment" in North Vietnam. And on Sept. 10, 1964, former Ford Foundation President McGeorge Bundy signed "National Security Action Memorandum No. 314," which approved the resumption of naval patrols and covert maritime operations off the coast of North Vietnam. According to The Pentagon Papers, each maritime operation against North Vietnam after October 1964 had to be approved in advance by former Ford Foundation President McGeorge Bundy. And among the maritime operations approved in advance by the now-deceased former Ford Foundation president were "ship-to-shore bombardment of North Vietnam radar site" and "underwater demolition team assaults on bridges along coastal roads, bridges and rails" in North Vietnam. 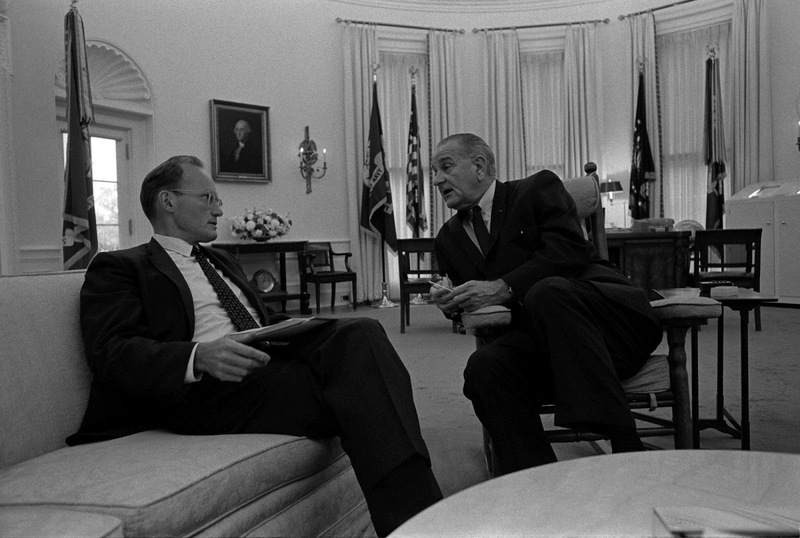 In a Feb. 7, 1965 memorandum to Democratic Party Leader Lyndon Johnson, former Ford Foundation President McGeorge Bundy next recommended that the U.S. adopt "a policy of `sustained reprisal'" against North Vietnam; and on March 2, 1965 the Johnson White House's "Rolling Thunder" bombing campaign against North Vietnam was begun. "We should continue roughly the present slowly ascending tempo of ROLLING THUNDER Operation...We should continue to vary the type of target, stepping up attack on lines of communication in the near future, and possibly moving in a few weeks to attacks on the rail lines north and northeast of Hanoi. "Leaflet operations should be expanded to obtain maximum practicable psychological effect on the North Vietnamese population. "Blockade or aerial mining of North Vietnamese ports needs further study and should be considered for future operations...Air operations in Laos...should be stepped up to the maximum remunerative rate..."
By the time McGeorge Bundy retired as Ford Foundation president in 1979, millions of people in Indochina and over 57,000 U.S. military personnel had lost their lives, as a result of the militaristic actions authorized by the "National Security Action Memorandum" which the former Ford Foundation president personally signed. A few years before his death in 1996, the former Ford Foundation president had been named as a "Scholar-in-Residence" by the same Carnegie Corporation of New York foundation which was to give a $25,000 grant to Pacifica in 1996 to launch the Democracy Now! show. As the Carnegie Corporation of New York's "Scholar-in-Residence," former Ford Foundation President Bundy co-authored a 1993 book with Stanford University Professor Sidney Drell and former Chairman of the Joint Chiefs of Staff William J. Crowe (who also sat on the board of directors of a Big Oil company called Texaco in the early 1990s), entitled Reducing Nuclear Danger. In the acknowledgement section of their book, Bundy and his co-authors noted that "the book is the product of a decision in 1990 by the Carnegie Corporation of New York to invite the three of us to work as co-chairmen of a Carnegie Commission on Reducing the Nuclear Danger;" and "we must express our warmest personal thanks to Dr. David A. Hamburg, the president of the Carnegie Corporation" and "the staff of the Carnegie Corporation has helped with unfailing kindness and understanding." "Saddam Hussein has provided a sharp reminder of a different nuclear danger--that nuclear weapons may come into the hands of unpredictable and adventurous rulers. We learned in Iraq that when international awareness, will, and capability are all three sufficient, it is possible to take effective action against such danger...The case of Saddam is unique both in the breadth of the international judgment that a bomb under his control would be unacceptably dangerous and in the strength of the American presence and engagement created by his aggression against Kuwait. Multinational action against the Iraqi bomb has been effective, at least in the short run..
"It is now evident that if Saddam's effort had not been interrupted by the war he provoked, he would probably have had nuclear weapons sometime in the 1990s--quite possibly in the first half of the decade. Knowing Saddam as it now does, the world has been shocked by this narrow escape. It is not surprising that an effective consensus has developed, growing in strength as the process of inquiry and dismantling has continued in Iraq, that the international community should see to it that leaders such as Saddam do not get the bomb." Yet three years after the former Ford Foundation president who was one of the U.S. Establishment leaders responsible for crimes against humanity in Vietnam joined his co-authors in rationalizing a pro-war policy in relation to Iraq that helped provide the pretext for the second attack on Iraq in 2003 by the U.S. War Machine, the Ford Foundation board of trustees asserted in 1996 that "the work of the Foundation today builds on Mac's legacy and we are in his debt." Former White House National Security Affairs Adviser Bundy’s successor as Ford Foundation President between 1979 and 1996 was a former U.S. Air Force Strategic Air Command Captain and former New York City Deputy Police Commissioner in charge of legal matters named Franklin A. Thomas. During his 17 years as the Ford Foundation’s president, Thomas also, simultaneously, served as the GOP Reagan Administration’s chairman of the Secretary of State’s Advisory Committee on South Africa and sat on the corporate boards of ALCOA, Cummins Engine, CBS and Citicorp/Citibank, whose special corporate interests the Democracy Now! show co-hosts claimed to be opposing during the 1998 and 2004 period when their show received Ford Foundation funding.